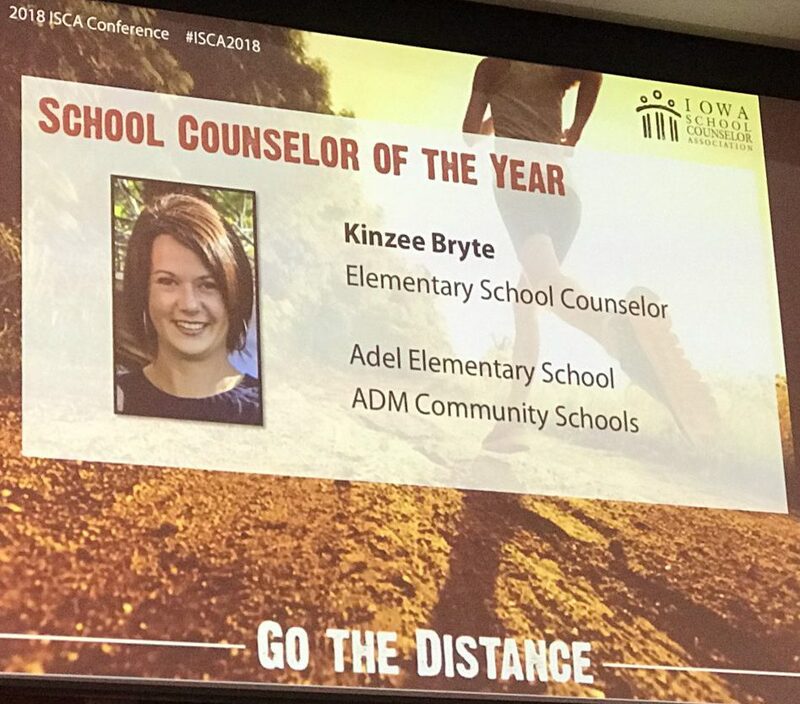 Kinzee Bryte, school counselor at Adel Elementary and DeSoto Intermediate Schools, was named the 2018 Iowa Elementary School Counselor of the Year by the Iowa School Counselor Association (ISCA) at the annual ISCA conference held in Altoona, Iowa on November 4-6, 2018. Kinzee Bryte has been a school counselor for 13 years, spending the last three years at Adel Elementary and DeSoto Intermediate where she serves over 1,000 students daily. Over the past few years, she has educated students, families, and staff on the roles of a school counselor, and implemented a comprehensive counseling program. As part of her counseling efforts, she introduced classroom guidance lessons, small group counseling, individual sessions, responsive services, and systems support at the two buildings she serves. One of the success indicators of Kinzee’s program is the number of self-referrals she now receives from the students. By advocating for students, Kinzee has taught them to advocate for themselves. A goal during the 2017-2018 school year for Kinzee was to reach more students in a proactive manner. To support this goal she researched the concept of flipped learning. To support the flipped learning approach in counseling, she made recordings of herself or found short clips of a lesson topic and shared them electronically with classroom teachers to show on her behalf. By creating these flipped “guidance extension lessons”, Kinzee was able to provide additional social/emotional learning for students throughout the entire school year. 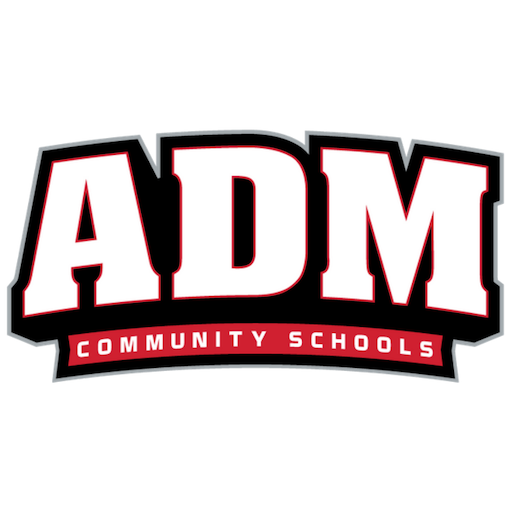 Kinzee has also helped establish a shoe drive for the ADM Community. She noticed that many kids were coming to school with inadequate shoes and developed a partnership with BASE, a local Adel, Iowa business to help meet this need. Kinzee also enlisted the assistance of the school nurse to measure students’ feet so correct sizes of shoes could be found for students. Through the shoe drive, 80 pairs of shoes were able to be acquired for students. The efforts of Kinzee in partnership with Base were huge success and a great community building experience for ADM.
Each year, a statewide award is given to a counselor at the elementary, middle school, and high school level. 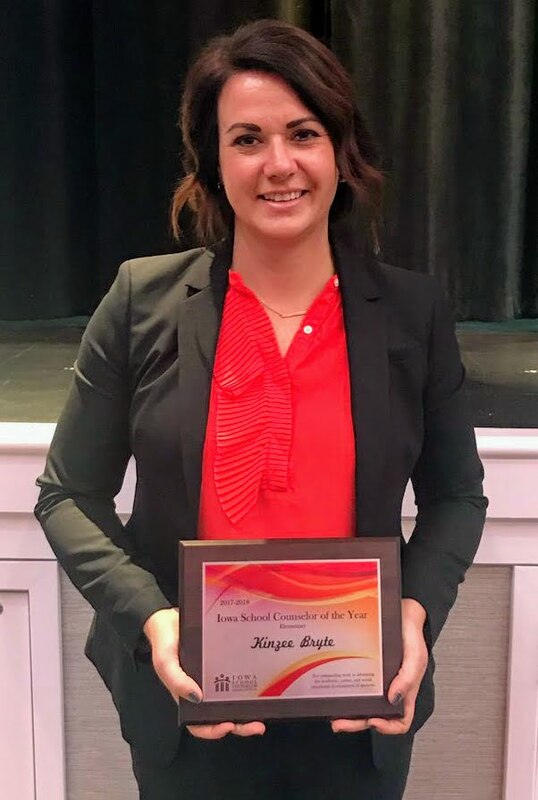 Kinzee received the elementary counselor award for 2018 and may have the opportunity to represent Iowa at the American School Counselors Association School Counselors of the Year awards ceremony in Washington D.C. after a selection in the spring of 2020.